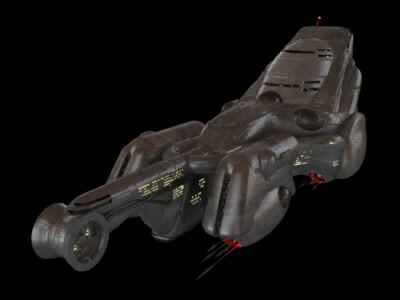 Based on a design dating to the early days of the New Republic, the Belarus Medium Cruiser is a versatile ship intended to fit a variety of mission profiles. It is an expansion and modernization of the Strike-class Medium cruiser, which was designed to allow for heavier armaments on what is a comparably small cruiser profile. However, the Strike-class' modular component design made it extremely vulnerable to dismantlement by larger weapons. The Belarus redesign amended these flaws by excluding modular technologies and employing above average defense capabilities. The Belarus Medium Cruiser is small for a medium cruiser class ship; yet its size masks its unusually large passenger capacity. With moderately powerful engines, a sleek appearance, decent cargo capacity and a host of armaments, the Belarus can thus be utilized for a variety of tasks, but particularly excels at troop transport missions.